September 21, 2016 – In what had been the country’s most overheated housing market, BC Premier Christy Clark’s imposition of a 15% tax on foreign buyers of Metro Vancouver homes was among other things, a political gamble, one that for now, appears to be paying off. Not only was this policy change unequivocally popular with people living in the region when it was enacted, it has also given Clark the most drastic quarterly increase in her job performance approval since winning re-election in 2013, up 7 points (34%) since the spring. Despite this bounce, Clark’s ratio of disapproval to approval is still nearly two-to-one. A provincial leader enjoying not only a jump in approval but a positive view of his job performance from more than half of his provincial constituency is Manitoba Premier Brian Pallister. A narrow majority (53%) say they approve of the way Pallister is running the province, up seven points from the last wave of this survey. While he says his relatively new Conservative government is bringing a “change in attitude” on issues of spending and accountability – it’s unclear whether his administration will continue to build goodwill over the short term as it gets down to the business of implementing promised spending cuts. Nonetheless, Pallister is now Canada’s second-most-approved-of premier. The most-approved of remains Sasktachewan’s Brad Wall. But while six-in-ten or more in that province have consistently – for almost five years – favoured his job performance – a notable and significant decline emerges this quarter. Wall’s approval slides nine points since the spring. It has been a politically turbulent summer in that province, as a potential sale of Saskatchewan’s telecommunications company, SaskTel, draws online protests, a once-trusted cabinet minister pleaded guilty to drunk driving charges, and the shooting death of Colton Boushie – an Indigenous man – ignited a debate about racism in Saskatchewan. In Quebec, where income taxes are reported to be among the highest in Canada, Premier Phillippe Couillard has seen his approval rating drop five points since May (33% then, 28% now). It will be worthwhile to note whether considered tax cuts will have an impact on this decline next quarter. The situation is relatively more stable for several other premiers, though that may not necessarily be good news. In Alberta, Rachel Notley’s job approval stands at 31 per cent, essentially unchanged since the spring (32%). The Premiers of Nova Scotia and New Brunswick also note small, statistically insignificant declines: 38 per cent of Nova Scotians endorse Stephen McNeil’s job performance, down three points since the spring. In New Brunswick Brian Gallant finds his approval rating off two points over last quarter, to 24 per cent. Newfoundland and Labarador’s Dwight Ball continues to wrestle with the fallout of an austerity budget tabled in the spring, a gloomy provincial economic outlook, and a nearly $2 billion-dollar deficit. That said, Ball is promising no more major cuts in a fall budget update, and sees his own approval rating tick upward four points from an alarming 17 per cent last quarter (21% now). Ball is not Canada’s least-approved of Premier, however. That designation rests with Ontario’s Kathleen Wynne. Disapproval among people in that province of her job performance most recently manifested itself in the premier being booed at a plowing competition in rural Ontario. Wynne’s biggest problem at the moment? Rising hydro rates stemming from the majority sale of Hydro One. While her government moved to ease some of the backlash by promising to scrap provincial sales tax on electricity bills, this measure is being met with skepticism in many corners, while others complain it will cost too much – $1 billion a year – at a time when the province’s net debt stands at more than $20,000 per capita. Against this backdrop, Wynne’s approval slides another four points to 20 per cent, part of a steady decline from 41 per cent in June 2014. Detailed graphs follow. 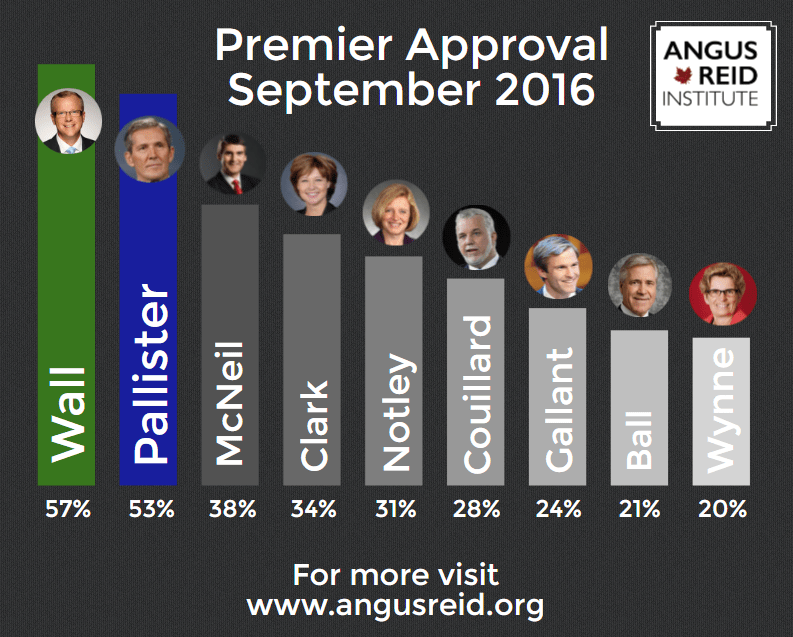 Note: There are no trendline graphs for premiers who are relatively new to office.